What is it that makes a school unique? What makes it somewhere you’d like to spend four important years? It’s not just the campus or the buildings; it’s the people you meet and the experiences that undergraduates share which shape the college community. Hear from current undergraduates on Hopkins Insider. What they do: No matter how far along you are in deciding your first destination beyond Hopkins, the Career Center can help—from selecting a major, to writing a resume, networking, job searching, interviewing techniques, and more. We serve all full-time students in Krieger School of Arts & Sciences and Whiting School of Engineering, freshmen through PhD candidates, post-doc and post-bacc students. 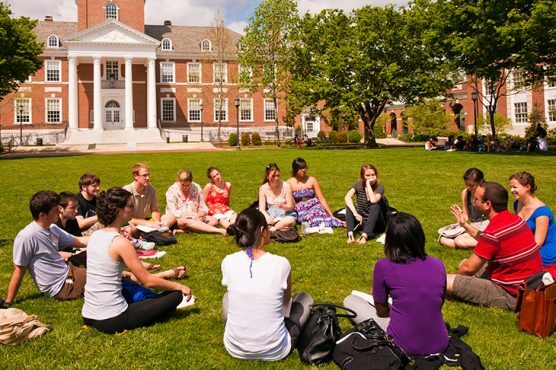 What they do: Through coaching, mentoring, collaborations with campus partners, and community-building programs, the Center for Student Success focuses on every aspect of your undergraduate experience, providing an environment where you can maximize your potential and acquire the ability to thrive — at Johns Hopkins and beyond. What they do: Chances are you’ll spend less than 20 hours a week in the classroom—a lot less than you’ll spend where you live and eat. Turn here to find on- or off-campus housing, learn about dining plans, work through roommate problems, and more. Your ties to Community Living won’t end once you leave university housing. Our staff also provide resources for those students living off-campus. What they do: The Dean of Academic and Student Services works with partners across the university to ensure student success both at Hopkins and beyond. With responsibility for the Center for Social Concern, Center for Student Success, National Fellowships Program, and several other areas, the dean’s office builds programs and initiatives in the area where academic and student affairs intersect. What they do: Johns Hopkins is committed to meeting 100 percent of students’ financial needs, through scholarships, loans, and other sources. Advisers at the Office of Student Financial Services can help families learn how to secure need- and merit-based aid, understand aid requirements, and find other ways to make a Hopkins education affordable. What they do: Hopkins fields 24 varsity teams—11 women’s and 13 men’s. The Blue Jays’ men’s and women’s lacrosse teams compete in the NCAA’s Division I, while the others compete in Division III. The rich history and tradition of the men’s lacrosse team and its 44 national titles are often the first thing that comes to mind, but all of our teams have achieved success: Hopkins is considered one of the top ten athletic departments in the country. What they do: HopReach is designed to ensure that students who are having difficulties at Johns Hopkins receive the support they need to succeed academically and get the most out of their college experience. What they do: While focusing on lesbian, gay, bisexual, transgender, and queer issues, LGBTQ Life’s goal is to make Homewood a welcoming environment for all. In addition to serving as a hub for LGBT people and allies, the office provides inclusion training, offers lectures, panels, and discussions, and advocates for campus and community needs. What they do: Whether you’re a first-year student, a transfer student, or a parent/guardian, the Orientation and First-Year Experience team will help you settle into Homewood by providing information about campus resources and ways to get engaged in your new community. You’ll get an overview of academics, student life, and what it takes to make a smooth transition to college. What they do: Our 63,000-square-foot recreation is about the same size as a football field (one of which happens to be right outside). The center features a gym, fitness center and weight room, racquetball and squash courts, climbing wall and bouldering cave, six-lane pool, and more. Free to all Homewood students; memberships available to other members of the Hopkins community. What they do: We help full-time undergraduate and graduate students in the Krieger School of Arts and Sciences and Whiting School of Engineering gain equal access and support for academic, developmental, and career-related needs. Students seeking support for a disability must register through our office. What they do: The SGA is the elected body that represents undergraduates at Hopkins. In addition to advocating for policies and services that benefit the undergraduate student community—including a textbook exchange, ride-share program, and off-campus housing database—the SGA also provides funding for approved student groups and is the voice of the student body. What they do: All work + no play = Not something we’d recommend. The Office of Student Leadership and Involvement supports more than 300 clubs and organizations, such as the Student Government Association, performing arts, religious and spiritual, departmental and research groups, and more—giving you the chance to develop leadership skills, build friendships, and create work-life balance. We also work with students to plan annual events such as Lighting of the Quads, hoptoberfest, and Spring Fair. What they do: The Office of Women and Gender Resources is committed to supporting and advising Homewood’s campus community on matters related to gender and the achievement of women students. They serve as a connector for resources on campus related to women and gender and aim to promote intersectionality and authenticity through collaborative programming and events.